When I left you last week, I was still a little behind, having just finished describing my sister’s wedding. Now, I find myself woefully behind once more. Maggie’s wedding is old news, so now we can go back to what’s really important, me (kidding, Maggie, I’m kidding). After my whirlwind weekend trip back home, I returned to a whirlwind week of work. On Tuesday (two weeks ago today) I returned to the field for some more intertidal surveying. A brief recap of why we survey in the intertidal zone is probably warranted here. 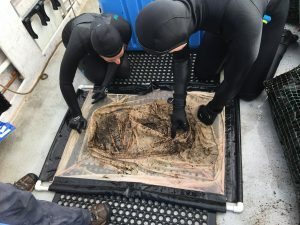 We are collaborating with Oregon State University and PISCO to survey sea-star wasting disease (SSWD) in Oregon’s Marine Reserves. SSWD is a gruesome infection which can cause sea-stars to lose limbs and disintegrate into the rock. 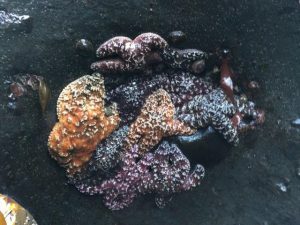 It recently re-emerged on the west coast and our surveys help to determine the severity of the outbreak (mostly in the species Pisaster ochraceus, thus the title). So, last week I led a group of volunteers out into the field. Though the disease is a serious one, the survey process itself is a blast. Basically, you wake up before sunrise, throw on some ill-fitting boots and uncomfortable waterproof pants, and try not to slip and fall on rocks and kelp for 3 or 4 hours. Awesome, right! It really is. I love being out in the field and getting my hands dirty trying to find tiny sea stars. Gotta have a good eye to find these guys. Fortunately, my volunteers did as well. My volunteer pool is basically the other summer interns living at Hatfield Marine Science Center. All of them are passionate scientists and most are accustomed to fieldwork, which makes them stellar sea-star surveyors. I’m really grateful for all of their help and how excited they are to lend a hand. Additionally, after the survey we all went for some of those legendary cinnamon rolls I raved about in my previous blog post. Great day. I spent most of the rest of the week toiling on my final presentation. This involved a lot of work in excel cleaning up datasets, punching in numbers, running stats, and making graphs that looked pretty. Sounds a little tedious, but all in all not a bad gig. Remember, I’m a nerd, so data analysis is actually pretty cool to me. In addition, I authored another installment of my SMURF blog and power-washed some SMURFs. This was all done in anticipation of the weekend though. Last weekend (weekend of the 12th) was the Seaside Volleyball Tournament, aka my opportunity to make all that time spent playing beach volleyball this summer finally count. Turns out I love volleyball. I’ve never played it competitively before this summer unless you count 5th grade gym class when I broke Nick Hipple’s glasses (sorry Nick), but this summer it’s been my main afterwork pastime. Early in the summer, three of my coworkers and I signed up to play in the Seaside Tournament, the largest amateur tournament in the world. My three teammates have all played competitively before and are super talented bumpers, setters, and spikers. Me? I’m tall. That was pretty much the only qualification that got me on the team. But I’ve played a lot this summer and I’d like to think I’ve improved. At least, Megan make fun of me less now than she did before. Anyways back to the tournament. Our team was named “Pretty Good” in honor of our talent level, but we played like champions. We utterly smashed “BBJ” and “stone cold chillerz” in our first two games of pool play (coincidentally, “stone cold chillerz” is my least favorite team name ever). In our third game of pool play we played the best game of our lives but lost a barn-burner to “Topher Rocks” (Topher did, in fact, rock). Finally, we bowed out in the knockout round against one of last year’s champions and his new team, the AJs. Major props go to Sawyer for being 6’6” and raining death and destruction down on our opponents from above. Megan’s sets were so perfect that even I couldn’t mess some of them up. Gabby worked harder than all the rest of us combined, and was covered in sand constantly as a result. For my part, I didn’t screw up too much. The real MVP though was our cheering section. Almost the entire intern population of Hatfield trekked up to Seaside with us and screamed their heads off in support. Legendary. Always nice to take a break from all the science to enjoy some sports. BUT. Anyhow, back to the science. I’ve now made it up to the beginning of last week! This week was supposed to be entirely consumed by working on my final poster/presentation, but somehow other stuff kept coming up. First of all, though, last Monday we had an ODFW Marine Reserves cookout after work partially in honor of Neal, Sarah, and I coming to the end of our program. It was a great reminder of how awesome the people I’ve worked with this summer are. The Marine Reserves team is full of brilliant scientists who are also genuinely cool people. There are plenty of graduate degrees spread amongst them, as well as plenty of experiences living in countries all over the world. Conversation topics range from “how to succeed in science” to “how awesome was Game of Thrones last night? ?” It’s a great group of people to work with and learn from. Back at work, I worked on my poster and presentation, but also spent an entire day road-tripping down to Port Orford to collect SMURF samples. Not a lot of work got done on my personal agenda that day, but I’m a big fan of throwing on some podcasts and driving so I consider it a success. My project did come together eventually though! With the help of my aforementioned co-workers, I put together what I believe was a solid presentation for our final symposium last Friday, as well as a nice poster. The symposium was a cool event in that it gave us an opportunity to share what we’ve worked so hard on all summer, and also learn from the other Sea Grant Scholars at the same time. My fellow Sea Grants are a pretty impressive group of people – incredibly smart and incredibly dedicated to their fields, which extend beyond just marine ecology. Definitely an awesome group that I’m proud to be a part of. Dang I’m gonna miss Oregon’s coast. I’ve fallen behind. Oh no. These past couple weeks have been an absolute whirlwind, as you’ll soon see. So I’ll break them down a little bit into two blog posts to make them more digestible for your reading material. Before I begin, I want to briefly discuss the post of one of my colleagues. In his recent post entitled, An Office, Cinnamon Buns and… Field Work? ?, Neal Tyson spends a full paragraph discussing the merits of Fishtails Café’s cinnamon roll deserves this much attention, right? WRONG. I consider myself to be somewhat of a connoisseur of breakfast pastries. Growing up, my cousin and I feasted ourselves on Walmart bakery donuts every time I visited him. While studying abroad in the Galápagos, I must have spent over one hundred dollars purchasing one specific type of donut from the local bakery. Each one coast $1.50, you do the math. It’s fair to say that I know my way around a cinnamon roll. And let me tell you, so does Fishtails Café. From the moment you feast your eyes upon it to the moment you take the last bite, it’s as if nothing else matters in the word. Not the calorie count, or the sugar content, or the years this cinnamon roll is probably taking off your life. During this time, everything is bliss. Neal and I have already hatched some schemes to get rich off of selling this cinnamon bun if this whole scientist thing doesn’t work out. Honestly, if you try it, you’ll understand. But I digress, when I wasn’t stuffing my face with cinnamon rolls, I was extremely busy the past few weeks. If you recall, when we left off I had just returned from an amazing camping trip at Crater Lake. Let me begin by elaborating a little bit on that trip. It rocked. Leaving work slightly early on a Friday afternoon, I piled into a small car for a nice five-hour road trip with some fellow Sea Grant Scholars and REUs here at Hatfield Marine Science Center. The Airbnb where we were staying was, interesting. It was a farm run by two guys living out of a school bus on the property and we slept on a dirt road. Actually, I slept in the car because it turns out you can’t really fit five fully grown adults in a three-person tent. Undeterred by our living conditions, we set out the next day to see what this whole Crater Lake thing was all about. Spectacular. 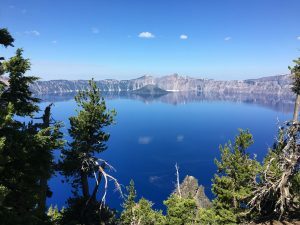 Kind of like the Redwoods, you can’t fully capture the beauty of Crater Lake in a photo or with words. It’s entrancing treading water and looking down to see nothing but the deepest of blues as far as your eye can see. In fact, it’s a little frightening swimming out in the open water of the Lake. At nearly 2000 feet deep, there’s a whole lot of nothing below you… Along with the lake we did some swimming in the nearby Rogue River (much to the chagrin of the nearby fishermen) and feasted on local cuisine. All and all a fantastic weekend. This was followed up by a very short but productive work week. First on my agenda was working on my final project for the summer. However, prior to that, I needed to decide what my final project for the summer was going to be. As you may have observed, my position this summer has been quite diverse. Instead of focusing on one research question and devoting all of my time and energy to that, I have been all over the place. It has been an incredible real-world experience where I feel that my efforts have truly been put to use in benefitting the goals of the ODFW Marine Reserves Program. Redfish Rocks, one of the Marine Reserves I’ll be discussing in my presentation. 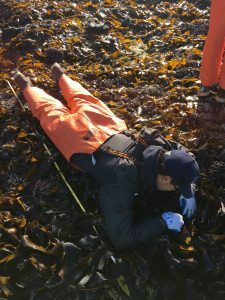 Instead of just an internship for the sake of another category on the resume, this summer has been all about really experiencing what it’s like to work in the field of marine ecology. It’s been fantastic, but at the end I still need a nice final presentation to wrap it all up. I won’t go into much detail on this project now, but with the help of my mentors I eventually came to the decision of presenting on the difference in fish recruitment inside and outside Oregon’s Marine Reserves. This project will use the data we’ve gathered from the SMURFs throughout this summer (remember what a SMURF is?). Along with working on my final project, I also spent a lot of time writing my latest installment of the ODFW SMURF blog. This was originally just a small task for me to take on over the summer. Each week I’d summarize the weekly SMURFing outing and provide a couple fun facts about the SMURF team or SMURFing in general. However, I found out that I love writing these posts, and the mini project has escalated substantially. Now every post I write includes awesome information that has been proofread by the entire SMURF team of collaborators, which includes ODFW scientists as well as Oregon State professors. The result is a pretty sweet post each week chalk full of SMURF science and plenty of SMURF puns. I kind of can’t help myself with the SMURF puns, there’s just so much to work with there! I highly suggest you check them out at http://oregonmarinereserves.com/news/. If you know me and read one, you’ll probably be able to distinguish my writing voice. I can’t help but put my own stamp on scientific communication. Lastly, I mentioned that the week was a short one. This was because I took Thursday and Friday off to fly all the way back home to Ohio. Why travel twenty-five hundred miles to spend just one weekend back home? My sister got married! This has nothing to do with my Sea Grant experience, really, but I’m still going to give a brief shoutut to Maggie’s wedding. I love the heck out of Maggie. She and my eldest sister, Elise (whom I also love the heck out of), never passed up on an opportunity to torment me with annoying songs or nicknames, but they also taught me a whole lot and shaped me into who I am today. 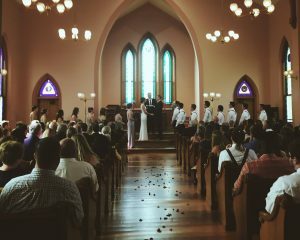 On August 5th I watched Maggie marry an awesome man. I’ve gotten to know Josh well over the past four years and he’s a man I’m overjoyed to call my brother. At the wedding, they were so happy. I was so happy. Everyone was so happy. Words fail yet again. I’d wish them a happy future together, but I already know they’ll have one regardless of what I type here. So all I’ll say is congratulation Mrs. and Mr. Keegan, you deserve every ounce of joy that marriage brings you. Jeezum crow doesn’t it look beautiful? I’m the groomsman third from the right. Thankfully this photo’s far enough away that you can’t see my very manly tears. On that note, I’ll leave you. More will be forthcoming shortly about my adventures of the past week or so. Stay tuned. A few weeks ago I wrote my blog post all about how scientists are people too. In general, what I was trying to highlight was how the people who conduct research and write scientific material have personalities and enjoy relaxing just as much as the next person. It seems poignant this week to revisit that theme. Scientists laugh, cry, eat, sleep, and so on and so forth. We are human, and if there is anything that can be said with absolute certainty about humans, it’s that not a single one of us is perfect. We have setbacks, make mistakes, and experience frustration. In fact, mistakes, setbacks, and frustration could be steps of the scientific method. It started with SMURFing two weeks ago. If you recall, SMURFing involves collecting juvenile fish in artificial habitats to help understand habitat usage in Oregon’s Marine Reserves. Currently, we have SMURFs in two Reserves, Otter Rock Marine Reserve near Newport (my home base), and Redfish Rocks Marine Reserve near Port Orford (~3 hours south). Every week, we alternate between sampling at Otter Rock and Redfish Rocks. Two weeks ago, it was a Redfish Rocks outing. At Redfish Rocks, we collaborate with a local team of urchin divers, who collect the fish from the SMURFs using their boat, then hand them off to us. All we have to do is drive the 3 hours south to Port Orford, pick up the fish, rinse some gear, and head home. Much easier than taking our own boat all the way down there. 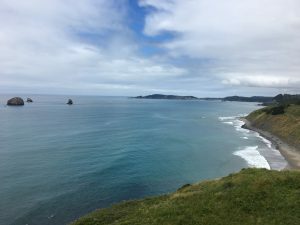 Port Orford has really embraced its Marine Reserve, and many citizens have taken advantage of opportunities to partner with scientists to aid research studying it. It’s a great setup where all parties benefit. Anyways, two weeks ago, I hopped in the car with Maddy (REU) and Neal (fellow Sea Grant Scholar) to head to Port Orford and pick up the fish. Our first task was to drop off a bit of equipment to the urchin divers before they departed so they could repair one of the SMURF moorings. Unfortunately, construction traffic meant we arrived just a few minutes early, and our collaborators had already left the docks. Oh well, minor setback. It just meant we had a few hours to kill while we waited for the SMURFers to return. Port Orford isn’t a bad place to kill a few hours. It’s a beautiful little town on the south coast with a brilliant ocean view. We spent our time snorkeling in a protected cove and feasting at a local diner, then returned to the docks to meet the SMURFers as they returned. SMURF season is in a bit of a lull right now, as normally occurs in the middle of the summer. If you want to understand why, read the latest blog post I authored for the Oregon Marine Reserves website here, but basically we weren’t expecting many fish. We got zero fish and a huge serving of bad news. Two of our moorings and two other SMURFs had disappeared. This is bad for a couple reasons. Firstly, it meant that we were sampling with just four of our eight SMURFs. Who knows if the other four SMURFs we lost would have had fish in them. Secondly, SMURFs aren’t the most high tech scientific equipment, but that doesn’t mean they’re cheap. Replacing moorings requires new lines, buoys, shackles, flags, anchors, and more, as well as time out on a boat to get them in the water. 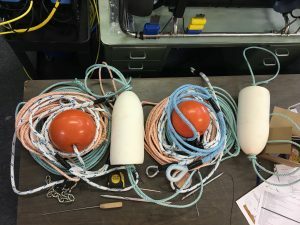 Readying new moorings for deployment! As far as setbacks go, this was a pretty major one for SMURFing. Maddy, Neal, and I had no choice but to retreat to Newport empty-handed; seven hours of driving and all we had to deliver was bad news. I was struck by how well it was received. To be clear, no one was happy to hear our tale, but there was no finger-pointing, despairing, or pity parties. All the scientists heading the project were only focused on fixing the problem. The very next day we were building new moorings, which will be deployed this week. Bad things happen in science, as they do in life. My mentors here in Oregon have obviously experienced adversity in their projects before and have learned how to handle it. For me, it was a great learning experience. Just a few days later, I had another learning experience. The end of July tide series had some of the lowest low tides of the summer, which made it perfect for intertidal sea star surveys. I’ve basically been put in charge of the sea star surveys which is a responsibility I was eager to shoulder. I’d been planning the July outings for weeks, checking tide tables, rallying volunteers, gathering equipment, and so on. When the time finally came, I was pretty excited to make it happen. I scheduled the first survey for a Sunday morning at 6 AM. I spent Friday and Saturday camping with my fellow Sea Grant Scholars for our mid-summer check-in (awesome experience, I’ll get back to that later), and returned a day early from the trip to do the sea star survey. Unfortunately, while I returned from the camping trip, my office keys did not. I left them in the glove compartment of my friends’ car so that I wouldn’t lose them… brilliant. This realization struck me on the way home and I made some frantic calls to try and borrow keys from other Marine Reserves members, but, being a Saturday night, my last ditch efforts were fruitless. With no way to get into our building to pick up my equipment or the keys to the truck, we had no choice but to cancel Sunday’s survey. I was not a happy camper. Really, I wasn’t a camper at all because I had left my camping trip early to do this survey. All of my hard work and planning undone by a tiny mistake, which had actually been a precautionary measure! 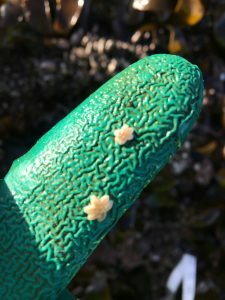 Some super small sea stars! My intrepid group of volunteers. Neal getting dirty for some sea star science. Thankfully, my anger was tempered by my mentor’s experience. “This stuff happens all the time in fieldwork,” she told me on the phone. Mistakes happen. Scientists, including myself, are very much human. The very next day, after collecting my keys, we were out in the field in the early morning, surveying sea stars. It was great. All of my volunteers came through and performed admirably in the intertidal, we found a ton of stars, and rewarded ourselves with a gigantic breakfast afterwards. It was enough to help me forget the frustration of the previous day. The past few weeks included some setbacks, but they were also some of the best ones of the summer. As mentioned earlier, we spent on weekend camping with the rest of the Oregon Sea Grant scholars. Half of the scholars are housed here in Newport, so I know them pretty well. The other half live on the south coast, so we hadn’t seen them since literally day one at orientation. To be honest, I was a little apprehensive about the trip. What if our two groups didn’t get along? Two days in the woods could feel a lot longer than that. Fortunately though, the other scholars are cool kids. We spent a long time hanging around the campfire, wading in streams, and catching up on the last few months. Overall, an awesome trip, and I’m glad we got to spend some good times with the south coast folks. Hopefully we’ll get to meet up again the next time I head down to Port Orford. Other highlights of the last two weeks included my second SMURFing outing. My first time out was perfectly calm. This outing was the perfect opposite. High winds meant big waves, and big waves meant a bumpy boat ride. I may have slightly realigned my spine bouncing up and down out on the ocean, but it was a cool experience. Now I can honestly say I’ve experienced the Oregon ocean. 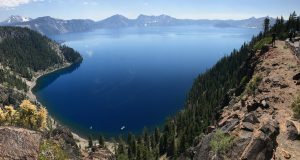 Additionally, just yesterday I got back from camping at Crater Lake National Park! Another Oregon bucket list item, crossed off. The place is absolutely gorgeous. You could stare at those blue waters for hours, completely mesmerized. We circumnavigated the lake by car and stopped off to do a couple of hikes, including one to the peak of the tallest mountain in the park, which has a stellar view of the lake. It was an awesome experience, truly. Finally, I finished off the past two weeks last night by partaking in one truly human experience that unites us all, watching Game of Thrones. 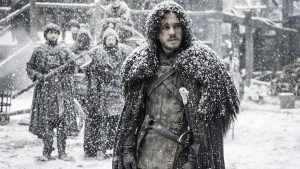 Winter is coming. But for now I’ve got four more weeks of summer at least. There’s that old saying that has been attributed to Confucius which goes “Choose a job you love, and you will never have to work a day in your life.” I don’t like it. For one, it probably wasn’t even Confucius who said it. A quick google of reveals that “choosing a job” wasn’t really an option back in Confucius’s day. But Ancient Chinese economic systems are waaaaay off topic. My real issue is with the content of the quote, not the one who said it. Unless you never hold a job and literally never work a day in your life, you’re going to work. Work doesn’t have to be a bad thing, though. I was reading a book recently (I can’t remember which book right now and it’s killing me) that talked about how the western world has created a division between “work” and “life” where “work” is some awful obligation we slog through just so we can live “life” during our time off. It sounds like a real bummer, honestly. I’ve experienced that with jobs in the past, but this summer so far has been different. To be clear, I have worked plenty of days this summer, and it’s felt like work. For example, last Thursday I woke up at 5:00 AM, ate a meager breakfast, and prepared to go on a cold, windy boat ride and jump into frigid waters. That felt like work. I’m not going to pretend I had a smile on my face the whole time, because that would be a complete lie. Still, I did it, and at 6:15 AM I went out for my first SMURFing survey of the summer. Verdict? Awesome and totally worth it. If you’ve been reading this blog faithfully you may remember what SMURFing is, but I’ll give a refresher anyways. SMURF: Standard Monitoring Unit for the Recruitment of Fishes. A 3 foot tall by 1 foot diameter cylinder of folded up plastic fencing which we suspend just below the surface of the ocean to serve as a habitat for fishes. Juvenile rockfish often settle (recruit) in shallow, nearshore waters before moving lower in the water column as they get older and larger. Here at ODFW we’re interested in how the rockfish utilize the shallow waters in Oregon’s Marine Reserves, so we have SMURFs deployed in and around two of the reserves collecting fish. Long-term, this project will inform our understanding of what effect the Marine Reserves are having on Oregon’s marine ecosystems. Every other week during the summer we (or our collaborators) collect fish from the SMURFs, count them, and measure them. Collecting the SMURFs is done by a team of two snorkelers off of boat in the wee hours of the morning. It’s sort of controlled chaos, really. First, the captain pulls you up close to the marker buoy and shouts the signal for you to disembark. You and your buddy then leap into the ocean, holding onto your equipment the best you can. Will (PhD student working on rockfish, and my snorkel buddy) carried the net for collecting the SMURF, while I carried a replacement SMURF. We hightail it over to the mooring, bag the old SMURF, clip the new one on, signal for the boat to return, and hightail it back to the ladder to check your catch. All this is done while competing with Oregon’s infamously inhospitable oceans. I was lucky in that my first SMURFing outing was on a very calm day. This meant swimming and staying warm was a lot easier, but by no means easy. For the eight SMURFs we had to collect that morning, Will made all eight trips into the ocean while MaddY (his REU student) each served as his buddy four times. When it was all said and done, we collected just 15 fish. This was a pretty small haul, but not uncharacteristic for this time in the summer. 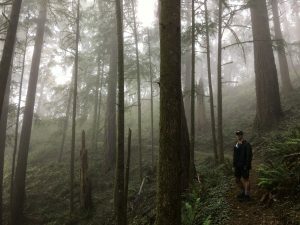 For more details about the science of SMURFing, check out some of the posts I’ve written at oregonmarinereserves.com. To summarize SMURFing and juxtapose it with Confucius’ quote, yes it part of my job, yes I loved it, and yes it was absolutely work. I didn’t spend all last week working though. In fact, my parents came to visit and I had mini-vacation! My folks flew in all the way from good old Ohio on Tuesday under the guise of delivering my wetsuit and weight belt. It was a good excuse for them to come see what the Pacific Northwest has to offer. During the week I’d spend my days at work while they bounced around Oregon’s coast, then I’d meet up with them in the evening to do some touristy things. For them it was vacation, for me it was like a working staycation I suppose. Then on the weekend we road-tripped down to the redwoods! Unreal. Absolutely unreal. If you’ve been to the redwoods you can understand what it’s like. If you haven’t, I’m sorry, because words and pictures are incapable of capturing what it’s like to experience those trees. It’s not just their size that overwhelms you, it’s how they’ve controlled these entire forest ecosystems for millions of years. Redwoods are stunningly resistant to fire, water, drought you name it. When one is damaged, it begins to grow a new clone right out of the burl at its base. Some animals live their entire lives up in the canopy of the redwoods, including salamanders of all creatures! 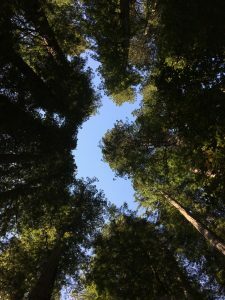 All the sword ferns, small trees, and young redwoods that make up the understory battle for the patch of sunshine created whenever a titan falls, literally growing over each other as they lean towards the light. It’s an incredible place for a young scientist, or anyone else for that matter. It certainly was an incredible place to my parents. The three of us were constantly on the go from one trail to another and we covered many more miles than I expected to, stopping frequently to stare in awe. “Stopping frequently in awe” was the theme for the whole road trip to and from Northern California as well. The Oregon coast is an absolute gem of a drive. What could have been a 5 hour drive, we spread out over a day so we could stop and experience as much as possible. My parents loved it, I loved it. I was more than happy to show them around my neck of the woods for the summer. At one point when we were stopped for a break during a hike in the redwoods, my mom asked me what I was pondering as I sat in silence. My response was “work,” which came as a bit of a surprise to them. Fairly, they didn’t think I should be stressing about my job while sitting in such an amazing place. But I wasn’t stressing about it, in fact I was more looking forward to what I have to do this week. It isn’t going to be a uniquely exciting work week, no SMURFing, but it is work that I know is going towards something that I really care about, and that’s what makes it worth it. I care about marine conservation just as much in the office as outside of it, so “work” and “life” aren’t mutually exclusive. This probably isn’t how it will always be in my career, but at this point I’m comfortable defying Confucius (or whoever it was) and saying that I go to my job every day and work, and I love it. Perhaps it’s because I’m accepting that all the tasks and early mornings are worth it in the long run. You might even say I’ve started to see the forest through the trees. Geez. 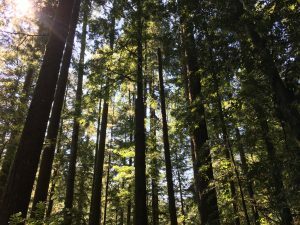 A “Confucius” quote to open and a redwoods analogy to close? I’m sorry. I just couldn’t help myself. There is a piece of vital information about science I feel I need to share at this point in the summer. Be advised, this may come as a bit of a shock. Scientists are people too. Every single one of us – human beings. If you are a scientist or know a scientist, you should know this. And if you’re reading this now and know me personally, I hope that you at least somewhat recognized this already. However, I accept that it can be easy to completely forget about the human dimension of this increasingly computerized, data-driven behemoth we call science. Last week provided me with ample examples of how we science geeks are just as human as anybody else. It began with the 4th of July last Tuesday. While the laws of nature may never take a day off, the people studying them certainly do. I spent the day at the beach with a couple other Sea Grant scholars and a handful of the REUs here at Hatfield Marine Science Center. Let me take a moment to say that every one of my fellow interns is incredibly bright. 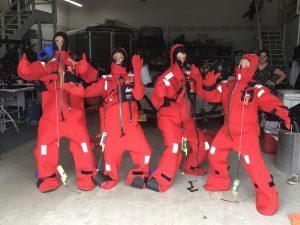 Each intern is collaborating with other scientists, conducting high level research on topics that range from oyster antibiotics to deep-sea volcanoes. I’ve had some great conversations over the past few weeks and learned a ton, because I’m living in close quarters with a group of geniuses. However, our collective genius is probably not always fully apparent. For example, we spent a significant portion of beach time trying to push one another out of a small circle in the sand while playing the classic Independence Day game “Beach Sumo”. Hey, even geniuses need to blow off some steam. We grilled out, played some more conventional 4th of July games (e.g. beach volleyball), and watched the local fireworks just like any other collection of human beings might on America’s birthday. And the next day, it was right back to work in the lab and/or office. Actually, for me, I wasn’t in the lab or office the next day. Instead I spent the day on a work road trip. Scientists take road trips too. Remember SMURFing? Well we took this road trip down to pick up the fish collected in SMURFs by our collaborators in Port Orford. 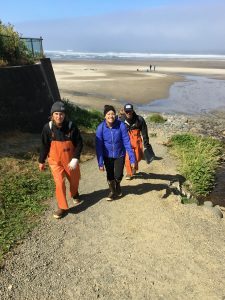 I travelled with Will, a Ph.D. student at Oregon State studying juvenile rockfish, and Madeline, an REU student working with Will for the summer. The drive to Port Orford is a long one and we filled it with naps, swapping stories, and jamming to mid-90s grunge music. Once we arrived, though, it was all science again. We were somewhat disappointed to have driven four hours to pick up only five fish, but that’s all that had been collected from the SMURFs that morning. As the old saying goes, science is as science does. Rather than turn tail and retreat to Newport immediately though, we chose to take matters into our own hands. The three of us donned our wetsuits and hiked down some 300+ steps at a former coast guard station to reach a beautiful protected cove where we snorkeled for about an hour, collecting fish with nets. Fieldwork is awesome. When the sheer cold of Oregon’s waters finally overpowered the warmth we felt from the beauty of our surroundings (and, more importantly, our wetsuits) we loaded up in the car and drove back to Newport in high spirits. A few days later Will, Maddy, and I went snorkeling for juveniles again, this time in Newport. Conditions were much more difficult. I don’t want to shame Maddy and myself with exact numbers, but the number of fish captured collectively by the two of us was borderline pathetic. In contrast, Will raked in 20 fish all by himself. If I hadn’t personally witnessed him eating a gigantic burrito an hour later, I might believe that perhaps he actually is a fish-catching robot, rather than human. I spent the most of the rest of my week working on writing up posts for the Marine Reserves website. Not to brag or anything, but the ODFW Marine Reserves Program has a fantastic website. 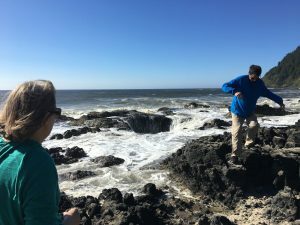 If you have any interest in Oregon’s oceans, marine conservation, or just have a spare 10 minutes I encourage you to check it out at http://oregonmarinereserves.com/. There’s some great information and photos on there about the reserves and the hard work we do here to monitor them. 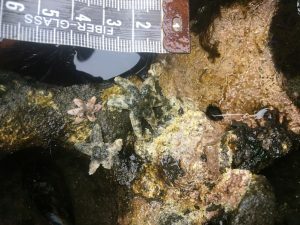 Over the course of the summer I’ll be writing several posts for the news section on the homepage, covering topics such as SMURFing, sea star wasting syndrome, and some of the other projects I work with. The first post went up last Friday if you’re interested! Writing these posts has gotten me thinking about all of the similar scientific material I’ve read either online or in print. All of these public posts and articles are written by real human people whether you believe it or not. And although the writing style is generally one that intentionally emphasizes the information over the author, I think some of the writer’s personality often leaks into the text whether they intend it or not. In my opinion, this is a good thing for communicating with the public. Making scientific information communicable involves expressing it in a way that interests the public. We’re all social creatures (even scientists), so we’re more interested in things that sound like they were written by humans rather than robots. Most people prefer novels over dictionaries, for example. Next time you’re reading something scientific –whether it’s in a newspaper, magazine, online, etc. – take a second and think about the person who wrote it. Can you tell a little bit about them just by reading it? Maybe they’re a distinguished Ph.D. with hundreds of publications. Or maybe they’re a slightly hungry 22-year-old who is two days late on their weekly blogging deadline, kind of like me! I do have a (somewhat) decent excuse for being a little late with this post. 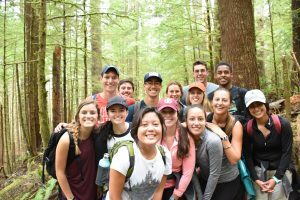 I spent this weekend camping at Mount Hood with the other Hatfield interns, as well as a group of REUs from Corvallis. That’s right, scientists camp too. The trip was originally planned just for the REUs, but the director of Hatfield’s REU program is awesome and permitted myself and a few other non-REUs to tag along. It was spectacular. We hiked a total of about 20 miles in some 48 hours, the highlight being a 12 mile hike that traversed rivers, boulders, meadows, and mini-snow fields, and ended on a ridge overlooking the majestic Mount Hood. All of this was enhanced by the great group of people surrounding me. We joke around, dance in the moonlight, float down freezing cold streams, have snowball fights/duels/ambushes, and so on and so on. We’re all 100% human, but also 100% scientist, and if there’s enough other students out there who are similar to us, our oceans are in good hands for the future. There seem to be two key factors that go into the field of conservation. First is finding/studying what it is you believe needs to be conserved. Second is convincing everyone else why the heck it’s such a big deal. I’ve always envisioned myself working primarily on the first side. I’m more scientific than social, a nerd, if you must. Yet this week I spent almost the entirety of my time working on the second side of conservation. 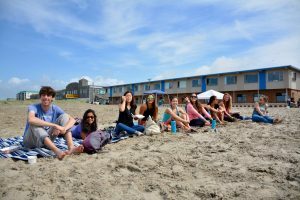 The Oregon Department of Fish and Wildlife Marine Reserves Program hosted several community outreach events across the coast, and my fellow interns and I were lucky enough to tag along for all of them! Remember that painfully clichéd “in the world of marine biology you either sink or swim” pun I made at the end of my last blog post? I hate to bring it up again, but it became even more appropriate during these outreach events. First of all, as I mentioned earlier, this was basically my first experience on the outreach side of conservation. To add to that, at the time of the start of the first event, I had been in Oregon for exactly one week. Yet there I was preparing to act as a representative of the Oregon Department of Fish and Wildlife. I think I was justified in feeling a little bit intimidated. 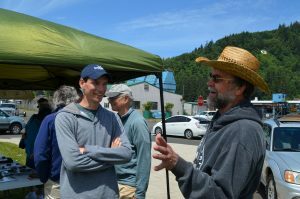 Our first event was a community barbecue in the town of Port Orford, which sits on the shore of Oregon’s first marine reserve (Redfish Rocks, look it up, it’s beautiful). 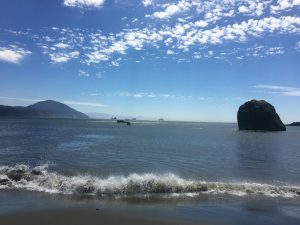 Port Orford is a tiny fishing town with a lot of people who know way more about Oregon’s fish than I do, so I knew I had to be careful or I could talk myself into uncharted waters very quickly. But it’s not too difficult to talk to people about something when it’s something that you A) are knowledgeable of and B) really care about. Luckily, I know a few things about fish and marine conservation, and I care a lot about both. The only stumbling block I encountered was my shoddy grasp on Oregon geography. I met people from Netarts, Yachats, Gold Beach, Brookings, etc. and I did a lot of smiling and nodding along, pretending like I knew where any of those places were. With the help of Google Maps, I eventually looked up all the towns I heard, and I was amazed at how far some people had come! The people of the Oregon coast (or at least those I have met so far) are impressive in their appreciation for our natural resources. Our main purpose for outreach was just to inform the public about who we are and what we’re doing in their oceans. Some who came were more interested in the free food than the free science, but it was remarkable how many were genuinely interested in the marine reserves and our monitoring methods. In Port Orford, our event attracted about 40 community members (quite impressive when you consider the town’s population is barely 1,000). That same evening we hosted a “Science at the Pub” event at a restaurant in Port Orford where we played Marine Reserves Bingo. Again we were able to get our message out to a lot of people. Port Orford was a huge success. My fellow interns and I spent the next day hiking and snorkeling all in the name of collecting footage for the marine reserves image database (what a great job). Then we were on the road again, this time up north to Garibaldi on the Tillamook Bay. 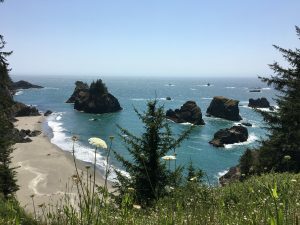 Cape Falcon Marine Reserve, 10 miles north of Garibaldi was the most recent addition to Oregon’s protected waters, and we expected a different reception there than the one we received in Port Orford. The process of establishing Cape Falcon Marine Reserve was met with much greater resistance than Redfish Rocks. You wouldn’t have believed that though if you attended our barbecue in Garibaldi. We hosted over 100 people (in a town under 1000!) and had to run to the store to avoid running out of burgers. Not only were the numbers impressive, but the people of Garibaldi were eager to talk. I must’ve talked to two dozen different people about the marine reserves and explained what a SMURF is at least 10 times. There was even an incredibly friendly couple who expressed interest in the Sea Grant program and asked me for the address to this blog, which I was more than happy to provide (If that couple is reading this now, hello! Thanks for stopping by!). 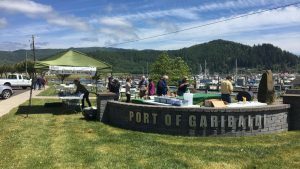 I shared info about the marine reserves and in return I learned so much about the history of Garibaldi, Tillamook Bay, and the state of Oregon. It was truly a fantastic experience. My hope is that our outreach events got at least a handful of citizens earnestly thinking about the future of Oregon’s coast, how they want that future to look, and how they might contribute to working towards it. That’s all I can ask. This man knew everything there was to know about the history of Garibaldi. I was happy to listen. After the outreach events I had a significant amount of downtime which I filled with hiking, biking, reading, running, and learning the real rules of beach volleyball. Concerning volleyball, one of the REUs living here actually told me “for someone so talented, you really don’t know anything”. I chose to take it as a compliment. Two weeks in, my experience in Oregon just keeps getting better. It won’t all be beach volleyball and barbecues I’m sure, but I’ll live with it. Have you ever seen the TV show Scrubs? If not, then you are missing out on some of the greatest television in the history of television. If so, then you can sort of understand what this week has been like for me. Scrubs follows three young doctors (JD, Turk, and Elliot) as they begin their careers at Sacred Heart Hospital. It’s hilarious. My sister and I can recite entire episodes, having both watched every season at least 3 times (shoutout to Netflix). But that’s not the point. The point is, when JD, Turk, and Elliot first arrive as interns, they know next to nothing. Everything they do is a learning experience, and every time they accomplish even the most menial task it’s a huge victory. That’s basically my life right now. This week I began my post as a Sea Grant Scholar working with the Oregon Department of Fish and Wildlife in their Marine Reserves Program. With me are two other Sea Grant Scholars, Sarah and Neal (the Elliot and Turk to my JD (I get to be JD because I’m writing this)). Together, we’re taking on the world, one marine reserve at a time. My inspirations. From the left, Turk aka Neal, JD aka me, and Elliot aka Sarah. 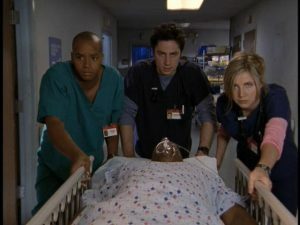 As the three of us leave the office every day, we all walk with a little bit of a strut, just like the Scrubs characters after a day in the hospital. You can’t help but feel a little proud after a day working hard for a cause that you really care about. Sometimes that involves scrambling over mussels in the rocky intertidal zone searching for sea stars. Sometimes it involves jumping into 50-degree water where you can’t see three feet in front of your face to try and catch juvenile fish. And sometimes it involves laminating papers. Just five days in, this has already been by far the most diverse work experience I’ve had, and I love it. I’ll be spending the summer undertaking ecological monitoring of Oregon’s marine reserves. Each of the five reserves is unique and monitoring all five is quite a task. Volunteer fishermen catch fish, take measurements, and release them. Longlines are also used to similar effect. Scuba divers and landers equipped with GoPros assess subtidal diversity. We also have two awesome submersible ROVs (Remotely Operated Vehicles) that conduct underwater surveys. But the monitoring project I’ll be working most closely on certainly has the cutest name. I’ll be spending much of the summer working with Standard Monitoring Units for the Recruitment of Fishes, also known as SMURFs. These adorable contraptions are basically a tangle of folded plastic suspended a few meters below the surface of the ocean. They serve as a great substrate for juvenile fish to take shelter in. Several have been set up inside and outside of the reserves to monitor fish recruitment. Collecting the fish involves snorkeling down with a Bincke net (pronounced binky) and grabbing the entire SMURF. Once you’ve got your SMURF in your binky (adorable right?) you take it up on the boat, collect the fish, take them back to shore and measure them. I haven’t gone SMURFing yet, but I’m really looking forward to getting out on the ocean. Though I haven’t SMURFed, I have spent a significant amount of time in the field already. I spent Thursday and Friday morning surveying sea stars at Otter Rock and Cascade Head. Sea-star wasting disease is a gruesome viral infection which essentially causes stars to pull themselves apart and dissolve into the rock. Not a pretty sight. There have been outbreaks in the past, but in 2014 it returned to Oregon with devastating effects. Recently the prevalence of disease has seemed to subside. However, it’s unclear whether that is because the populations are recovering or because only the largest stars are highly susceptible and they have been mostly wiped out. That’s why we monitor. 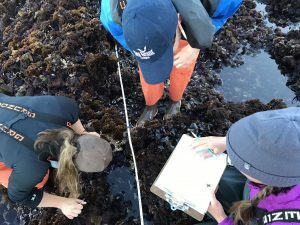 We crawl on our hands and knees, comb through algae, and splash through tide pools on the hunt for the “lions of the intertidal.” It’s basically a safari. Plus I’ve gotten to see the sun rising over some beautiful beaches. Anyone who knows me will tell you how much I love Ohio and Pennsylvania (where I’m from and where I went to school, respectively), but the natural beauty of Oregon blows the Midwest out of the water. It’s been a spectacular start to the summer so far. I’m working for an awesome cause undertaking an awesome project in an awesome place and meeting some awesome people. It’s awesome. What has stood out to me so far is how quickly I’ve been able to get involved with meaningful work. We spent one day doing hiring paperwork, and the very next day I was in the water trying to capture black rockfish in a net. Pardon my awful closing pun, but in the world of marine biology they toss you in the deep end and it’s up to you to either sink or swim. Sorry.